No technical skills, previous experience or budget for paid tools needed! As of July 1st 2018, Google Chrome V68 adds warning labels for ANY websites which haven't yet added SSL protection. In case you're not familiar with SSL, it's a type of encryption which prevents any communications between the visitor and the site from being read or forged by a 3rd party. So, in other words, visitors on SSL secured sites are protected from hackers trying to their steal passwords or credit card data. And when they do, they won't be sticking around long enough to enter their passwords... and they'll be even less likely to enter their credit card information! Which means income from your non-SSL secured sites is about to take a significant hit. And if you think for a moment you can ignore this warning because few visitors use the Chrome browser, think again. Chrome is reported as by far the most popular browser by a number of sources. We'll show you how to get a FREE SSL certificate for any of your sites. And we'll also walk you through setting up SSL protection for your all your websites. It's an easy process when you follow our clear and simple steps. You'll be protected from a potentially HUGE income drop off in January if you take action NOW by picking up CloudDefender today. Even better, you can also make additional income by having this know-how in setting up SSL. 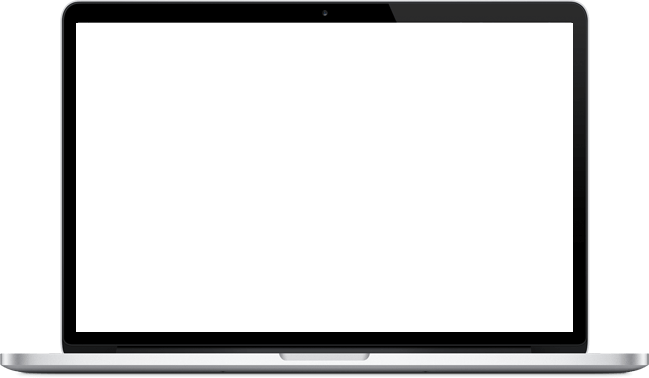 If you're a current website service provider (SEO, web design, copywriter, etc.) you'll be able to add SSL set up to your client offerings. This is a service your clients will WANT and NEED. If you yet haven't taken the plunge as a service provider, this could provide you with a nice bit of side income. All you need to do is show potential clients the statistics you've just viewed and you'll have a VERY easy sale! If, like me and MILLIONS of others you're running sites on WordPress, the following message may be the most important information you'll read this year. Just consider one date: October 21, 2016. Practically half the internet was shut down in a MAJOR attack. Major sites including Twitter, Spotify, Reddit, CNN, PayPal, Amazon and MANY more were completely out of service for hours. Not to mention authority news sites like The NY Times and The Wall Street Journal. "Something Huge is Going Down, DDoS Attacks On October 21 were Just The Beginning"
"Major cyber attack disrupts internet service across Europe and US"
"Global internet outages continue as second wave of hacker attacks cripples web servers"
YOUR Money Sites Are At Risk Every Single Day! "Attackers are exploiting any vulnerability they can to compromise websites and commandeer their host servers … Attackers target both large and small businesses … If there is profit to be made, attackers strike at will "
How Can A Hacker Profit From Your Website? And more recently, with ransomware! "Mysterious spike in WordPress hacks silently delivers ransomware to visitors... People running WP sites should take time to make sure their SERVERS are fully patched and locked down with a strong password and two-factor authentication"
Imagine - a visitor comes to one of YOUR sites and within seconds has their computer shut-down … and is told to pay to get a passcode to unlock their computer. That, friends, is the end of your online reputation if it happens to you. Hackers are ALWAYS testing the web for weakness. They practice - on servers like yours and mine - every day. If they find a vulnerability, they'll jump in and do everything they can to steal your online assets. According to Securi's Website Hacked Trend Report, in the first half of 2016 FOUR out of FIVE hacked sites were based on WordPress. There's never been a MORE important time to secure your WP sites and servers. As a niche marketer and consultant for over 12 years, I manage hundreds of profitable websites for both myself and clients. Many years ago I personally had sites hacked and saw firsthand the damage it did to my profits. So have spent considerable time developing systems to prevent this from ever happening again. Improved Security = HUGE Increase In Site Speed, Conversions & Profits! After my 1st server attack years ago, I quickly learned how costly it can be in terms of both lost profits and time. 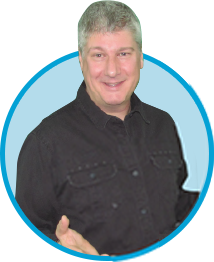 It took DAYS to shut out bad traffic, secure my subscribers' personal information, and get my sites back online. During this time none of my affected sites generated a penny in income. Not to mention the hundreds I paid out in bandwidth overage charges. Now I lock down my servers using the same systems authority sites like Cisco, NASDAQ and The White House use to protect their online assets. There are so many options and settings, CloudFlare is just too scary for most to tackle alone. If you miss one piece, you leave yourself open to bots, scrapers and hackers. No problem if you can afford a developer or are willing to pay monthly fees to a specialty security service. But for the average website owner, this is a completely unnecessary expense. Don't Want To Pay Hundreds Per Month On Web Security Solutions? You don't have to, because I've developed a method that lets you use CloudFlare like the pros. 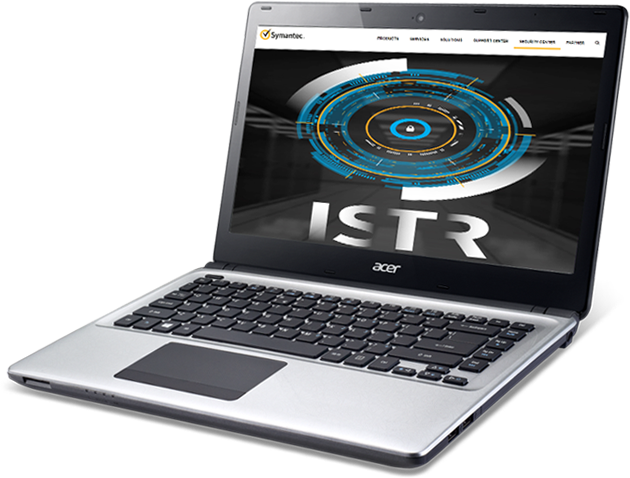 This is the most up-to-date, COMPLETE website security system available today. AND let you earn monthly profits by selling it as a service. How Does CloudDefender Protect My Sites AND Make Me Money? It's easy. Install the recommended plugins (all free), then follow the step by step modules to configure your settings. I show you EXACTLY how to do it. So you get more QUALITY traffic combined with higher conversion rates. Without paying any extra for traffic OR forking out big bucks for ongoing security services. Then, offer this as a security service to clients, and you can charge monthly recurring fees to give them the same benefits! Then, offer this as a security service to clients, and you can charge monthly recurring fees to provide them the same benefits! Use the above table as your very own pitch to sell the service! The included developer rights mean you can change the name and brand the service as your very own. Yes Matt, I Want To Maximize Profits From My Sites AND Earn Ongoing Monthly Revenues! By now you're aware of the constant attacks on servers, big and small, across the world. What would you do if your lead and profit generating sites were shut down? Most security experts say it's only a matter of time before unprotected servers get hacked. Can you afford to take that chance? When a simple, one-time cost effective solution is staring you in the face? How Do I Know CloudDefender Will Work For Me? If for any reason you're not happy with CloudDefender within 30 days of your small investment, you qualify for our 100% money back guarantee. No hassles, no issues, no bad feelings. But I'm not stopping there. configure the plugins and follow the simple instructions, and you'll see a boost in site speed, SEO scores and conversions. All while locking down your server against the most malicious internet attacks that are happening everyday. Plus you'll see the income potential of offering this as a service to clients. A service that sells itself, in a time when WP site owners need it more than ever. If at any time over the next 30 days you don't see these benefits, just contact our support desk and we'll gladly refund your tiny investment. 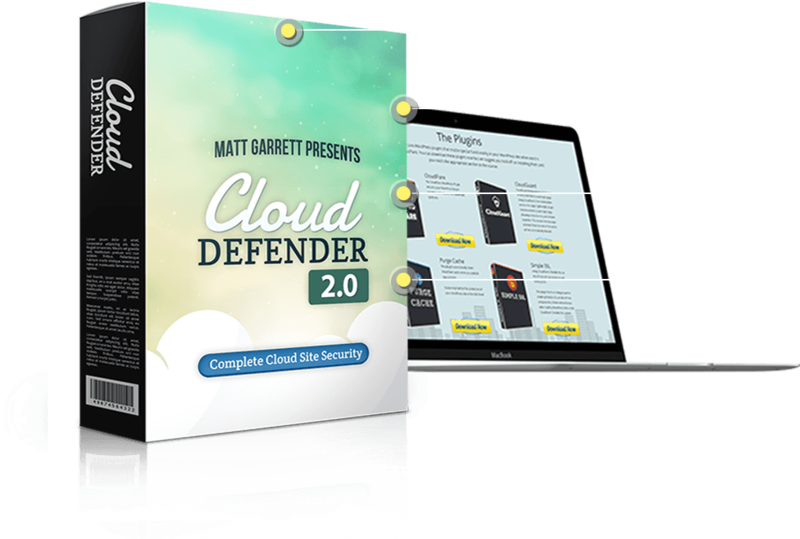 Grab CloudDefender PLUS Developer Rights FOR A COMPLETE Website Optimization AND Income Solution At This STEEP Discount While You Can! Dime Sale Offer: Price Increases With Every Sale! You've seen the MASSIVE attacks against servers occurring almost daily. You KNOW that WP is especially vulnerable to these attacks. Do you want to continue to roll the dice, just 'hoping' that somehow your sites stay safe? Risk your current and future income as well as the secure information of your subscribers? OR … do you want the easiest, most cost-effective solution to protecting both yourself AND your subscribers from malicious attacks? AND, increase your site speed, conversions AND free organic traffic for less than the cost of a take-out dinner? Not to mention the ability to add an ENTIRELY NEW income stream to your business, by helping the millions of other WP site owners to secure their servers? Hit the button below before time runs out. This is a very limited offer. 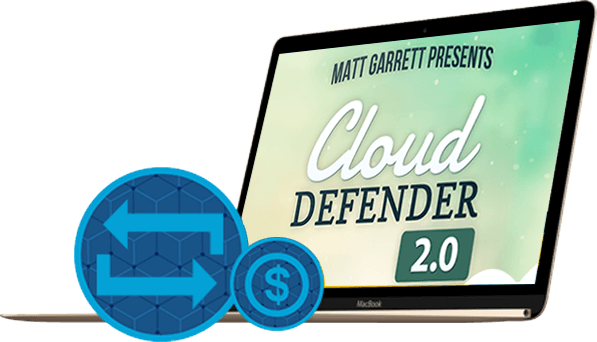 With all the development that's gone into CloudDefender and my decision to include developer rights, I can't promise it will ever be available at this price again. 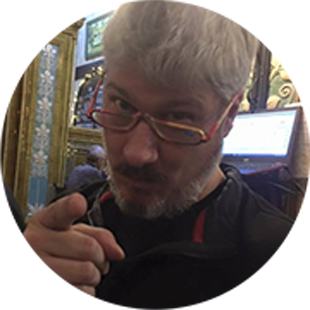 You're getting my PERSONALIZED system to completely lock down your server for the ultimate in website security. The plugins, apps and pro tips. The no-fluff, PDF training guides with screenshots to make it EASY to set up, along with the handy quick start checklist. PLUS the ability to sell this service for a passive income stream. There's never been a more CRUCIAL time to protect your online assets than right now. And that means there's never been a BETTER time to offer web security as a service than right now. Everything you need to do both is included in CloudDefeder for one very low, one-time fee. 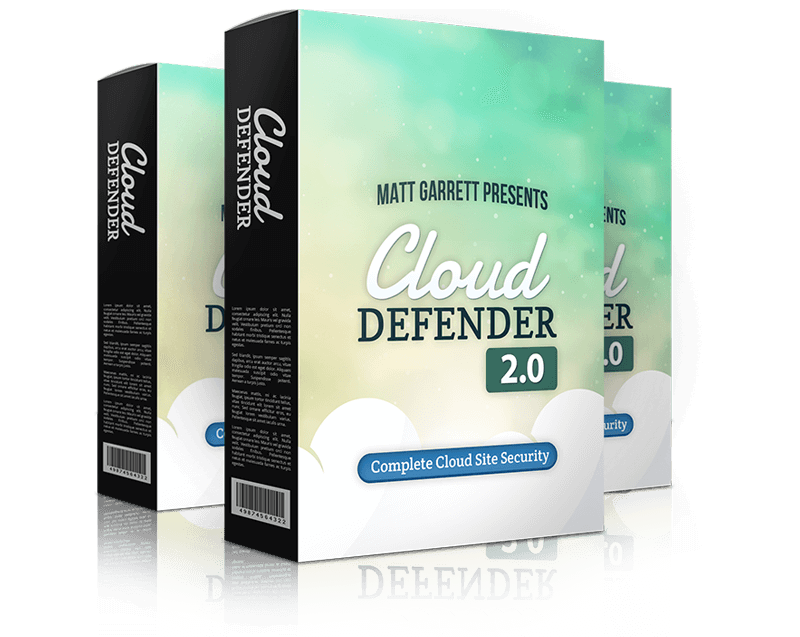 Claim Your Exclusive Discount And Grab CloudDefender Today! P.S. As you read this, malicious bots, page scrapers and hackers are testing sites world wide for vulnerabilities. Looking for backdoors and a chance to steal content, subscriber information and more. Will your sites be one of them? You've worked hard to build your money sites, and now is the time to protect them. P.P.S. Imagine how you'd feel if you passed on this incredibly low-priced offer, then found in days or weeks from now that your server had been hacked? Instead of growing your business, you'd be spending time AND cash just trying to restore it, and possibly trying to rebuild your entire online reputation. It's happened to me, which is why I've developed this system so it NEVER has to happen to you. Q. I'm an existing customer for Ver 1.0, Do I need to buy again to get Ver 2.0?? No, simply login to your existing Cloud Defender membership and you will find you have been automatically upgraded to Version 2.0. Q. Will this work on my Mac? Absolutely. 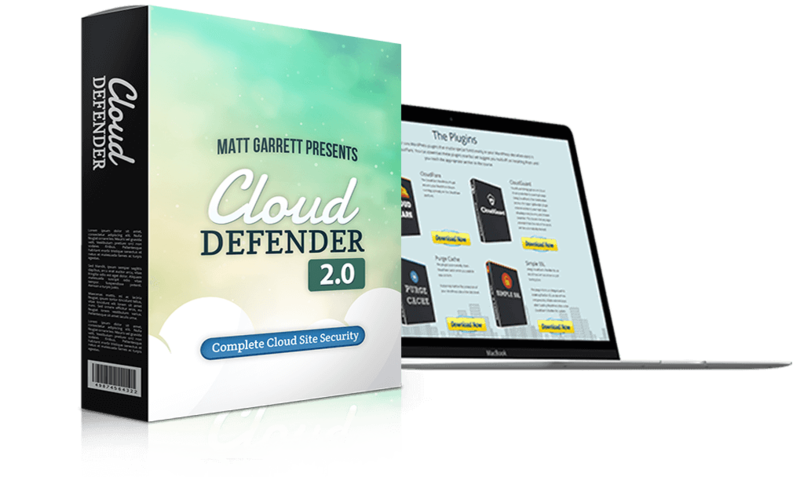 Just like WordPress, CloudDefender is a cloud-based solution that works on any operating system. If you've got internet access, this will work for you! Q. Will CloudDefender protect against ANY attack? As of today, we can say CloudDefender will secure your SERVER from 99.9% of any potential vulnerabilites. It's impossible to stay ahead of every threat, but this customized solution is the most cutting edge security protocol available at any price. The great news is CloudDefender turns your servers into MAJOR headaches for potential hackers, meaning most will take one look and move one. Q. Do I Need Any Technical Skills? If you've got a WP site, you know everything you need to follow the simple instructions to set up CloudDefender. Installation is as simple as activating a few plugins and following the step by step training. Q. How Do I Make Money With This? In addition to maximizing profit potential from your own sites, your investment includes developer rights. Meaning you can sell CloudDefender as a service to as many clients as you choose. Change the name, rebrand it and offer ongoing web security services to any client with a WP site, in any niche.